Doctors told Margret Dagmar that her son Keli, who lives with a severe form of non-verbal autism, would never be able to communicate; she was told that he would be best off locked in an institution for the rest of his life. Driven by a love for her child, Margret embarked on a mission to find a way to connect with him. Oscar Award-winning actress Kate Winslet paired up with Margret and Keli to produce a documentary film about their journey. The team found an organization called Helping Autism Learning Outreach (HALO), where specialists taught Keli other ways to communicate. He now composes beautiful and deeply moving poetry; one poem Keli wrote is called "The Golden Hat," which describes a magical hat that enables an autistic boy to communicate. 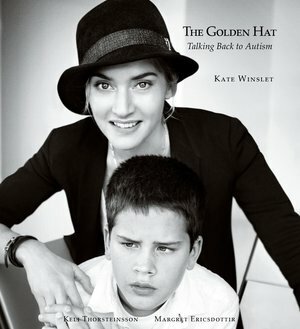 Inspired by Keli's poem, Winslet developed a way to raise awareness and funds to support autism outreach. Her project asks friends to pass a hat-chosen from Kate's closet-from one to another, after they've each taken a self-portrait wearing it. The list of those photographs includes Angelina Jolie, Steven Spielberg, Oprah, Sting, Daniel Craig, and many more.